There are times, especially when relaxing at the end of the day, when a collection of short stories goes down better than a novel. Such collections usually require less concentration than lengthy novels and the possibility of skipping to the next story in case the first one didn’t grab us is always attractive. While anthologies may group various authors with diverse story telling ability and a high chance that you will like something in it, the book itself could have its ups and downs, with styles being markedly different or uneven. Collections by single authors on the other hand, have the advantage of story-telling and stylistic consistence allowing one author to explore varying themes and story lines. 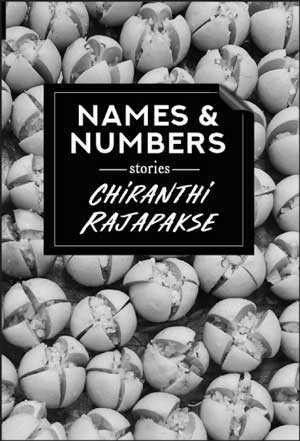 Chiranthi Rajapakse’s debut assortment of stories ‘Names & Numbers’ is one such book. It is a slim volume that gathers together various short stories, vignettes and anecdotes and squeezes them between a culturally appropriate lunu-dehi cover. Characteristic of the genre, the 14 stories in this book provide unexpected twists and turns either throughout the narration or at the end of a particular narration. The eponymous title story, ostensibly about migration, segues into prejudice making us shift sympathies along the way. 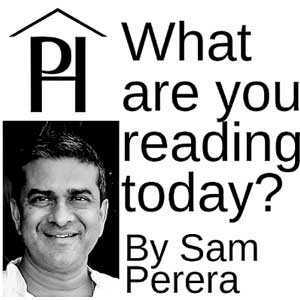 All of the stories have a typically Lankan bitter-sweet feel and address issues we have all grappled with. Issues of anxiety arising from our 30 year civil war; the abandonment of a parent; unexpected changes in career choices; various ethnic differences coupled with or offset by technological advances; our sinister mistrust of the ‘other’; the nostalgia evoked by migration; the rare and surprising nature of ethical behaviour, and the topic Lankan writers feel guilty about most – our unavoidable class issues. Using prose that is both subtle and sober, Rajapakse evokes the yearnings of a country in flux and a people in search of a cohesive identity. The situations she colours in are those that all of us are familiar with, those we would have encountered in the not-so-distant past and will, for those reasons, resonate with many of us. Understandably, the longer stories have fuller character and plot development than the shorter ones and allow for shifts in mood and sympathy. However, the nature of short stories is such that as soon as you get settled in and think you’d like to read more about particular characters or their situations, the story draws to a close, leaving you hungry for more. With this, her elegant debut collection of stories, Rajapakse was unsurprisingly rewarded by a shortlist nomination in the most recently-concluded Gratiaen Prize. With that encouraging endorsement behind her, one expects her to develop into a serious writer who works towards bringing out either another collection of excellent stories or a full-fledged novel.